Bob ran into engine trouble with his truck on Friday, and ended up having to get it towed back to his house. With a lot of lumber already strapped to the top of it (slated for delivery here), he ended up renting a large cargo van, and reloaded tons of things to bring over to our place. 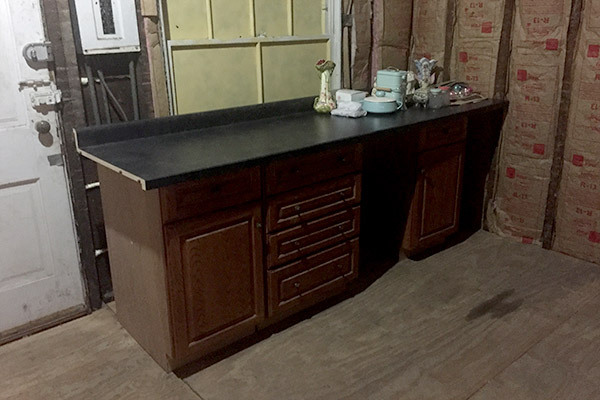 In addition to a ton of supplies, he also brought over some kitchen cabinets, for us to use in our new (and official) kitchen. In addition to unloading the van chock full of stuff, we also loaded it back up for a return trip. With us planning to do a lot of demo in the coming weeks, we needed to clear out the last remaining “large” furniture items in the house – namely a lovely curved glass cabinet, and a hall tree. Our “new old” furniture, as I liked to call it. Things are really starting to change up down on the first floor.